The president, who has been exchanging letters and Twitter messages with Kim about a potential denuclearization deal, made the remarks as he traveled to a campaign event in Fargo, North Dakota. "I know that a letter, a personal letter, is being delivered to me from Kim Jong Un that was handed at the border yesterday," Trump said. Trump said he thinks it is going to be a "positive letter." On Thursday, a South Korean envoy who recently returned from meeting with Kim in Pyongyang said that the communist leader reiterated his commitment to denuclearize "if the countermeasures are taken simultaneously." 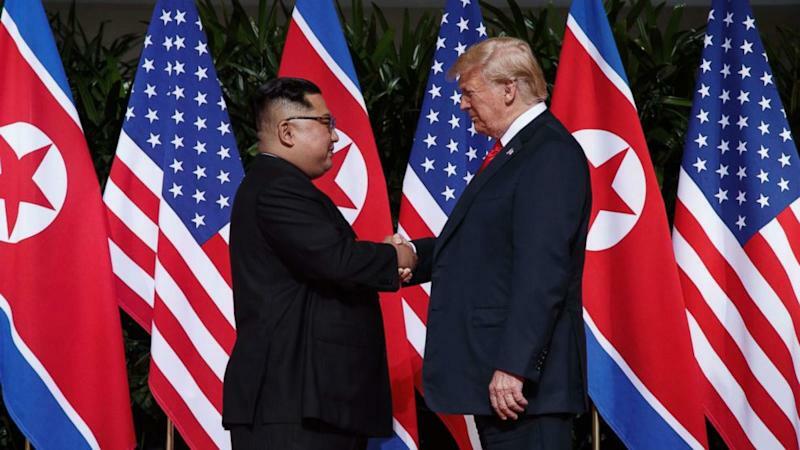 The envoy said Kim told him he hoped to have complete denuclearization and end the hostile relationship between North Korea and the United States before 2021. "Yesterday he said I want to make this deal and denuclearize during President Trump’s administration, so let's see what happens," Trump told reporters. "But he did write me a letter and the letter's being delivered to me, I think it's being brought in by Mike Pompeo," Trump said. Trump, who met with Kim face to face in Singapore earlier this summer to begin the long denuclearization process, admitted the relationship started out "very rough" but said the "rhetoric between myself and Kim has been very good." The president gushed about Kim on Twitter Thursday following news that Kim wants to reach an agreement before the end of Trump's first term. "Kim Jong Un of North Korea proclaims “unwavering faith in President Trump.” Thank you to Chairman Kim. We will get it done together!" Trump tweeted. It was a dramatic change in tone from just two weeks ago when the president called off a meeting between Pompeo and Kim citing a lack of "sufficient progress with respect to the denuclearization." The president seemed pleased with news of a new letter from Kim, even noting that it's being delivered in an "elegant way" -- that is, not electronically. "It's actually the way it used to be many years ago before we had all of the new contraptions that we all use." The president himself does not use a computer.